I am currently in the process of testing the Nikkor 400mm f/2.8E FL lens in my Imatest lab and I am simultaneously also measuring the performance of the new Nikon TC-14E III teleconverter and comparing it to the older TC-14E II. Although I am planning to review the teleconverter separately, I decided to give our readers a glimpse of the teleconverter performance when compared to its predecessor in terms of sharpness. To make it easy to compare differences, I converted all numbers to percentages (detailed numbers will be posted in the reviews). That’s pretty interesting data – let’s do a quick analysis. It seems like the new TC-14E III does really well on new lenses. Based on my data, performance differences varied between 3-4%, which might be worth looking into for those that want ultimate sharpness with their “E” series lenses. Based on how well it worked on the 400mm f/2.8E FL, I would assume we would see similar performance improvements on the 800mm f/5.6E FL and any future Nikkor super telephoto lenses. The performance in sharpness between the new TC-14E III and TC-14E II is practically non-existent. Looking at Imatest numbers, the difference stays very close at 1% mark, which is within the margin of error. Not worth moving up to in my opinion. Now this one is interesting, because technically the TC-14E III does not work on the 300mm f/4D AF-S. When you mount the TC, the camera shows two “EE”s, indicating an error. If you look at this teleconverter compatibility chart, it clearly states that the 300mm f/4D is “not compatible”. To get the TC to work, I set aperture on the lens to f/4 and changed camera options to set aperture on the lens. The camera was locked at f/5.6 for aperture, so I had to move to manual mode to properly set exposure (aperture priority also works). As you can see from the result, it is less than 2% performance difference, so not much of an improvement here either, even if Nikon made the TC-14E III work with the 300mm f/4D. Same result here – it seems like the TC-14E III does not do better compared to its predecessor on this lens. With less than 1.5% difference in sharpness, it practically brings no benefit. Unlike the Nikkor TC-20E III, which was significantly better than its predecessor, it seems like the new TC-14E III teleconverter is only beneficial to use on the newest Nikon lenses for the most part. Based on my tests so far, it did very well on the new 400mm f/2.8E FL lens, but its performance was rather disappointing on older “G” type lenses like 70-200mm f/2.8 and 200-400mm f/4. As I get my hands on other super telephoto lenses, I will continue testing the TC-14E III and will update this article with additional information. If you have additional data or information on how the TC-14E III performs on your lenses, I would love to hear your feedback in the comments section below! I was never able to get a TC-14EII to work well on my 70-200 f/2.8 VR II (three strikes and you’re out). However, my first copy of the TC-14EIII works great. A small drop in hit ratio, but acceptable. It now stay mated to the lens. It could be the TC II+Lens+Camera combos I tried with the TC II. The TC III + 70-200 I am using on my D810. In the past I had tried TC II + 70-200 on D800E, D600, and a few other cameras. I could never dial it in. Very little cost difference between 14 II and 14 III (new), and as that is the only lens I want a TC for, the III works great for me. As a side note, the AF Fine Tune # (+3) I use on my D810 for the 70-200 without a TC, is the exact same # I use on my D810 WITH the TC III + 70-200. I was quite surprised by that. I have noticed that the AF Fine Tune #s on my D810 are all lower than the numbers I have to use on other cameras with those lenses. William, I too have had great results mating my TC-14Ell to my 70-200 VR ll, both wide open and stopped down. I was thinking maybe you had a flange issue but that wouldn’t explain why lll works well. I just got a used TC-14E II at less than half the price of a new TC-14E III and was worried that I might have made a mistake. I feel better now having read your review. Dave, yes, I would not waste your money on the new version, unless you have the newest “E” type lenses. I have all three of the existing TC’s for Nikon. I have had good success with both the 1.4E II and the 20E III on the 70-200 f2.8 and the 80-400G. Although I do have the 1.7 TC as well, I don’t seem to use it that often. Mike, you would be surprised by how good the 1.7x TC is with the newer bodies like D810 and D750! Which 1.7 are you referring to? I did a side-by-side comparison of the TC14Eiii and the TC14Eii on both the Nikkor 500mm f4 VR and the Nikkor 300mm f2.8 VRii. Shooting both test charts and real life images I could see no difference in sharpness even pixel peeping at 200%. So I sent the TC14Eiii back and saved £450! Dear Nasim! Will you provide some data on this (like in your upcoming review of the 400/2.8E)? You seem to imply that type E lenses work in a different optical way and that tho has prompted the ned TC-14EIII. Is this correct? Interesting as I’ve heard (and seen) numerous examples from others showing a marked improvement over it’s predecessor, particularly on the 500 f/4 VR – my main interest. Looking forward to the full review and testing…. Rob, I have not tested the 500mm f/4 VR yet, but based on what I am seeing so far, the improvement is only on the newer “E” type lenses with electromagnetic diaphragm. Thanks Nasim. Even though I fine tune the D810 with my 500/1.4 II I just can’t get it sharp enough to where I can accept it. I was hoping this might be the answer but it seems like I’ll just have to learn to live with a tc that works on my 300/f4 and that extra $500 in the bank. I cannot understand how the electronic aperture could influence AF speed or resolution. A request – when you post the full review will you please describe the calibration procedure you used with the different lens/tc combinations? I have never read a review of a teleconverter that mentioned the necessity of recalibrating the Auto-Focus Fine Tune setting after adding the teleconverter. I find quite different settings are sometimes required with two tcs of same type attached to a particular lens. Thanks. My D4 and D7100 both adjust automatically AF-Fine Tune settings for 500mm f/4 alone, and with 1.4x, 1.7x, and 2.0x tc automatically on 500mm f/4. To be clear, when shooting with the D4, AF-Fine Tune setting is +14 with 500mm f/4, +12 with 500mm +1.4x, +6 with 500 + 1.7x and +12 with 500 +2x. Yes, I agree. It would be wonderful if Nikon extended functionality for distance and focal length as you suggest. Also, I have two 1.7x tcs and they require different AF Fine tune settings. The cameras cannot handle this, so I have them labeled and am careful to use one on 300mm f/4 and the other on the 500mm f/4 lens. Can you not work around this by using the 2 last digits of the serial numbers for your combinations of lens and TC-17? I don’t understand what stops them from doing it. Wouldn’t that be sufficient ? David, thanks for this. It confirms my own experience. My 500 VR on my D800 needs +6 correction but with the TC1.4E II it needs more than +20 max to correct front focusing. I now have the new TC1.4E III and will be checking it later today. A TC needing more than 20 (+/-) of AF fine-tuning should be sent in for service. My first TC-20EII needed more than -20 and was replaced under warranty. In South Africa that kind of customer service is a dream. The new TC1.4Eiii also needs about +20 so I suspect that its my D800 that needs adjustment. Hmm Nikon warranty should be the same worldwide but perhaps the dealer is reluctant to send it in. You could try if setting the default AF fine-tuning negatively would help. That would the require possitive setting for all other lenses to counter for that. I am not sure if you can even out like that as I have not tested it. If you have more lenses than AF finetunig slots you are out of luck. I just got a brand new 85/1.4 lens back warranty service. It required more than +20 before but now needs -20. I generally dislike when you are at the end of the scale as you don’t know if you are at optimum resolution. I just tested the default AF fine-tuning and it does not seem to work as the individual lens AF fine-tune! In other words the same settings on the lens scale or the default scale does NOT give the same result. This complicates thing as it is probably not feasible to try to “rescue” an extreme lens by using the default off set. I am pretty sure the available overall range of adjustment is limited between +20 and -20. In other words I dont think one can get to +40 for example by setting default at +20 and individual lens also at +20. Anyhow my images with TC and AF at +20 provide marginally more detail than shooting without the TC and cropping to same fiield of view. Your reviews and conclusions are awesome and so detailed! Comparison has been added, sorry for the delay! And yes, I am working on the 20mm f/1.8G review, hoping to publish it within the next few days. What mode are you doing these tests in if not manually? Are you shooting jpegs or raw? If jpegs, what camera settings? Pete, I always use manual for testing lenses – priority modes don’t work. I simply stated about the two modes, because those are the only ones that actually work with the TC-14E III and 300mm f/4D AF-S. I don’t have ether TC 1.4s only the 2.0 III, but from other reports I have seen on line people seam to feel the contrast and AF is better. Maybe the new TC 4.0 III is not sharper, but has better contrast and IQ allowing for better AF and more shots at perfect focus. I have gotten some nice results with the 70-200 f2.8 and TC 2x III but I know it’s very important of AF to be dead on, and will use LV if I can. I am surprised it is not a major improvement over the marque II. Have you tested it with the 300 F2.8 VR? I was using this combination in lowest light recently. The results were impressive. I found focus speed was still quick. I use both the 1.4 and the TC20eIII With the 300. I can use the TC 20eIII and all the focus points work. One question about the plans for this TC. I hear rumours about the 300 F4 VR. If and when the it arrives, I wonder how many focus points will work with that if you use the new TC1.4eIII with it? Thanks for the review on the TC’s. I have been using Kenko’s (cheaper knock off) for a number of years. I don’t know if you have experience with this, but is there a big difference between the Kenko’s and Nikon’s? I too eagerly await your review of the new 400mm f/2.8 FL as I am itching to purchase this lens. In your experience – do teleconverters usually produce uglier bokeh than using a given lens without it? I noticed that my backgrounds are much more pleasingly blurred using the 300mm f/4D AF-S without the 1.4 II than with it. Anyone have the auto fine tune settings for the 300mm + TC 20lll Nikon combination? adding to previous post, with the D4 and D800 cameras. Nasim: I look forward to reading your full report comparing the TC-14E III vs TC-14EII. I just reread my earlier comments and realized the basic point I was trying to convey was not clear. 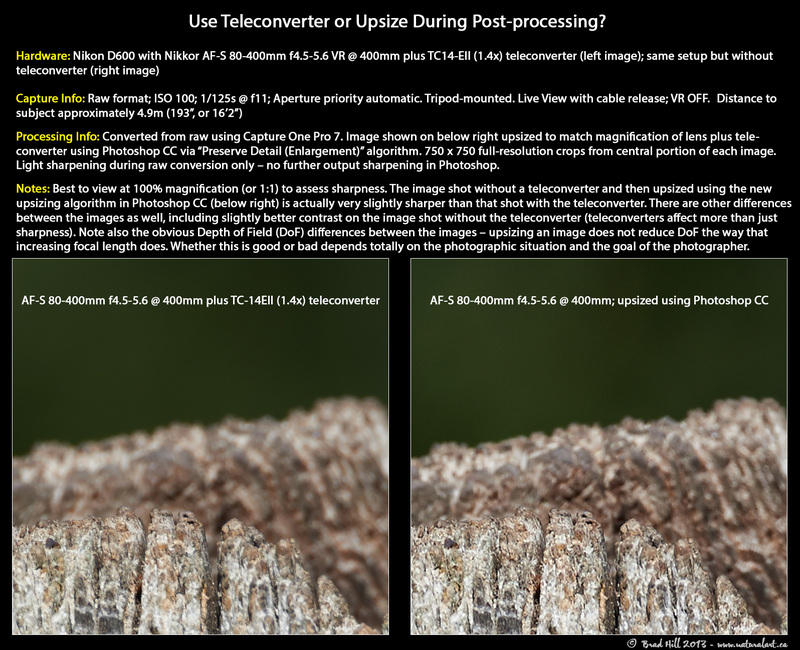 The image degradation observed when using Nikon Teleconverters in autofocus mode would be a combination of the basic degradation imposed by the teleconverter AND any degradation that resulted from a failure to recalibrate Autofocus Fine Tune after attaching the teleconverter. Thus, interpretation of the data concerning degradation is difficult unless it is known that recalibration of Autofocus Fine Tune occurred. It seems that Imatest can indeed work with tiffs so a comparison seems possible. But does it make sense? Perhaps not. I know too little about the Imatest to give a qualified answer. After having now used the new 1.4 converter for a few birding sessions on my 500 f4VR I am not seeing any visible improvement in sharpness over the older TC but colour is a little warmer. Unfortunately the new TC seems to vignette a lot more than the old one. I have also discovered that in-camera NR settings can exert a much stronger effect on apparent sharpness than the TC does, especially since for birding I am often forced to shoot at high ISO due to the need for fast shutter speed with long lenses. I am now getting visibly better results by removing or reducing the in-camera NR and applying NR and sharpening separately to subject and background via masks in PP… the point of bringing this up is that one shouldn’t blame the lens and TC for soft images until you have gotten to grips with the way your camera is cooking your image data. BTW I process in CNX2 – not sure if the above would apply to LR. Dear Nasim, would it be possible to use Imatest to compare upsizing with use of TCs? Hi! I replaced the TC-14E II with TC-14E III in August. I mainly use it on 400/2.8VR (old version) and the results are very good. I think the difference with the previous version is that the results wide open (F/4) are better while old version needed little stopping down to about F/5 to get maximum sharpness comparable with 400mm without teleconverter. Both converters work really well with 400/2.8 but the new one is slightly better in terms of sharpness and maybe also contrast. I have tested it also with 70-200VR II and my experience is that new one is better at least in long end in terms of sharpness. I havent tested other lenses right now but my friend told that with 500/4VR the new version is also better than the old. i’ve 70-200 f4 so teleconverter with 1,4crop was my only choice. I tried the older TC-14E II and newest TC-14E III and in reality I didn’t recognize any difference. Thus, except for the design and gasket on the TC-14E III. I have the 300f2.8 vr2, like me I think the users of this lens is most probably the biggest users of TC’s. I have the TC1.4ii and iii and as this TC is used for 80% of my wildlife photography, I was really keen to see if there is any improvement. I use it on a D810 and Df. I love the Df for big game in Africa. So I have done several tests with both TC and both cameras. I found that the TCii on the 300f2.8 with the Df vs TCiii show no visible improvement ecept in low light the focus is faster. On the D810 it is a different story, it is almost a new lens, sharper with almost no loss between naked lens and TCiii, the color especially bright colors are better and again focus is better in low light, might be the fact that there is less glass. On the 70-200f4 the TCiii again showed better results on both cameras in respect of sharpness as well as color and focus. I an a NPU so took my cameras and lenses with TC’s to Nikon to ensure focus callibration. The effect was that the TC2.0iii needed to be fine tuned on the D810 and Df. The TC1.7 I needed adjustment on the D810. For me the TC1.4iii on the D810 and 300f2.8vr2 justify the investment. I just love this lens on the D810, using it with all 3 TC’s produce great results, plus shooting it in 1.2 crop or even 1.5 crop makes for a very flexible combination. I find it impossible to justify an investment in a 600f4 given these results and flexibility. I have used the 600f4 and 400f4 before and both fantastic but I don’t have the budget to have the 300 + any of the other 2. Can you speak to the newer TC’s performance with the 200mm f2? Do you think it’s worth going with the new one? What do you think about the choise between 14e II and III with 300mm 2.8 VR?Will it benefit much from the III or it is very good indeed with the II? Keep on the great site, one of the best in world. I would also like to now how these two compare and I’m mainly keen on the f4 preformance. I have a Nikon 200-500mm and understand my TC1.7 will work with that lens but I have to manual focus. Is this true? I shoot with a D750. Does anyone have any information on using the new (backordered) Nikon 200-500mm f5.6 with either the TC-14 11 or 111? I do not know if the TC 1.4 111 would be the same exactly. Any suggestion on TC 1.4 (Which version) i am using Nikon D7100 with Nikkor 200-500. I own both the TC-14e II and the TC-14e III. There isn’t much of a difference between the two, but I did notice that in some situations the new version focuses a little bit faster, so if you shoot action or anything that moves fast, I’s suggest getting the TC-14e III. On the other hand, if you have other lenses you’d like to use with a TC, you’ll probably want to check Nikon’s compatibilty chart to make sure that they are 100% compatible with the TC-14e III. If they don’t then, you’ll either have to get an older version of the 1.4x TC or be stuck shoot these lenses wide open when using the TC-14e III. Do you know if there is any difference between the TC-14E i and TC-14E ii? I cannot find anything much on the internet about the original TC14E. Ken Rockwell states that they are identical and the newer second version was essentially just a rebadging to incorporate ‘AFS’ into the title. But I tend to be cautious with his opinions however so wondering if you or anyone else has used the original or heard whether it differs in quality compared to the second (‘ii’) version. I want to thank you for publishing your teleconverter tests. To my knowledge, you are the only person who has published hard data on this subject. I’ve referenced your articles on a few different occasions on other forums in which I participate. There are a lot of people who incorrectly believe that the 1.4x TCs noticeably degrade image quality, and your articles have been valuable in making “believers” out of them. On that note, I recently noticed that on my sample of the 200-400mm, my TC-14e II has been producing a bit of a “glow” or spherical aberration when I shoot wide open in certain situations. I’ve not experienced this with any of my other lenses, including the 70-200mm f/2.8G VR II or 300mm f/2.8 AF-S II. I’ve been using this combination primarily on a D7200 and do not recall experiencing this with my FX bodies, so I will need to perform additional testing to determine whether there is a problem with my lens, the TC, the combination of the two and if this is limited to the D7200. In all honesty, I can’t remember using this combination on my FX bodies for anything other than random tests around my neighborhood. I have done extensive “field test” with the TC 1.4ii and iii on my Nikon 300 G f2.8 vr2. It is clear that the iii is a better match with my lens, it is not only sharper but the color and crispness of the images are better, plus the focus is also faster. I tested the 2 TC trying to photograph Swallows in an open field with my D500. My success rate with TC 1.4ii as very low just because it is that fraction to slow. The results with the new TC was almost as good as the naked lens. What I also noticed is that image quality on the D810, D500 and D4s was sharper and color depth better than with the old one. But on the D4, D700, D3s and D300 there is almost no difference. For interest. I own the D4s and D500 and used the D300, D810, D4 and D3s from members of our photo club who also owned the 300 f2.8 and the 200-400f4 vr2. We found similar results on the 200-400vr2. So, the result is that I support the idea that it improves sharpness on the new lenses, I would say on most prime lenses. I would upgrade for the overall IQ improvement except if I was using older bodies. I have Nikon 500mm f/4 G lens. I am currently using 1.4x TCii . I want to know is it good to upgrade to 1.4iii version? Hi, I have the same question Nikon 500/4VR + 1.4EIII. Any experience? I have had a big problem with Nikons teleconcerters. I travel a lot with my small motorboat and the teleconverters dont withstand the shake. The bajonet gets slappy and after some time the screws dont get it thigtend anymore. I have the 3d TE1.4 now and have had earlier copies repaired but after some while you have to buy a new one. The 500/4VR+ D4 has been a heavy combo ( muck of the reason) so I now changed to D500, mostly due to weight. Thank you for the tip on how setup the TC14E-III with older AF-s telephoto lenses. It now works very well with my AF-s 500mm f/4 IF-ED first version (I had “EE” message before I use the aperture ring and changed the aperture settings in the camera’s menu). The results TC-14E III + AF-s 500mm f/4 are outstanding, believe it or not, the image is sharper (and have more contrast) when my 500mm f/4 is use with the TC-14E III (at f/4) compared to the lens itself! This is the first time I notice a teleconverter improving the lens original sharpness and contrast! Hi, i have a Nikon D5300, i am looking at getting a Nikon 300mm f4 pf prime lens, will this work with a TC 1.4x converter mk11 or mk111, regards Mark. Можете ли Вы мне помочь с таким вопросом. Я пользуюсь для съемки птиц следующей связкой: Nikon D7200 + Nikkor 300 mm f/4 PF + TC-14E-III. Без использования конвертера никаких нареканий (кроме своих кривых рук) у меня не возникает… А вот с конвертером начинаются проблемы. Я понимаю, что так или иначе резкость должна быть хуже, но еще и гораздо хуже становится работа автофокуса. Но вопрос даже не в этом, а в том, что при использовании конвертера иной раз при похожих условиях съемки вся серия получается не резкой в той или иной степени. Снимаю я при следующих настройках: приоритет диафрагмы, авто-ИСО, минимальная выдержка 1/640, центровзвешенный замер, следящий фокус чаще всего по одной, реже по 9 точкам. Насим, может есть какие-нибудь специфические моменты при использовании конвертера? Может надо сильнее прикрывать диафрагму (хотя у нас последнее время большие проблемы со светом ), может не стоит использовать следящий режим и включить покадровый? Может еще что-то, чего я не знаю? Буду раз за помощь и консультацию! I have Nikon D500 & D7200 bodies and Nikkor 70-200 E FL VR, 200-500 F5.6E and 300mm F2.8 G ED VRII lenses, plus others. I also have Nikon TC-14E MkII, MkIII & TC-20E MkIII. When I use my 300mm F2.8G ED VRII lens on my D7200, I need an AFFT figure of +20 to align/mate this combination together. Please note that this combination was set by Nikon Australia because I was having trouble with terrible images and I couldn’t find a solution. When the equipment was tested by Nikon Australia, they found that the D7200 was rear focusing and they fixed that, they 300mm F2.8 was within specs, but the 1.4X MkIII was “Not even close” to being within specs. They adjusted the camera setting for the TC-14E MkIII/300mm F2.8 combination with a setting of +20 and refused to replace the offending teleconverter, saying that the “Plus twenty figure was in fact just a figure and not to pay any attention to it!” I still get varying results from the set-up and I’m not at all confident carrying it into the field. . .